Darren and I went to our first rugby game since moving here (and my first professional game ever). I loved it! 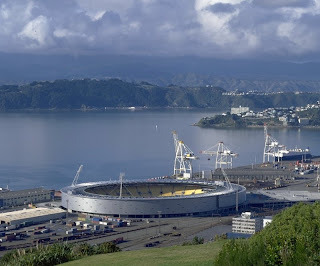 Like everywhere we go, we walked to Westpac Stadium, which is near the train station. The location is quite handy for those who ride the train in/out of town, as there is a raised walkway that leads from the train station to the stadium. As we neared the stadium, we could hear a recorded general announcement. The “voice” told us not to bring in any alcoholic liquids, but that water bottles were fine. I actually did have one on me, and the guard at the gate just opened it, did a sniff test to make sure it wasn’t alcohol, and handed it back to me. The best part of the announcement, though, was this statement: “as well as being really really bad for you, smoking is not allowed anywhere in the stadium”. Awesome. On the way to our seats, we walked by all the food and beer stalls that are in any typical stadium – noting that one in particular was selling “American hot dogs”. I didn’t test one, but promise I will next time! Most of the stalls offered the regular stadium fare: hamburgers, fries and beer. However true to Kiwi culture, wine was also offered (in tiny individual-sized bottles) in addition to curry. Moreover, the beer was actually sold in bottles, not in overly-priced-watered-down cups found in most American stadiums. The prices were reasonable too - $5 for a beer, $7 for wine. We found our seats pretty easily – we had decided to pay a bit more for the ‘silver section’ so that we could be closer to the middle of the field, as opposed to behind of the goal posts. We even took the risk of sitting in the uncovered section – luckily the weather held! The game was slated to begin at 7:35 pm. And let me tell you, rubgy games are so much more efficient than football games! I had anticipated some of the same fanfare that American football games have – an anthem of some sort, followed by announcing of the players, the running out of the players…the dicking around in general. Instead, they announced the beginning of the game, the players ran out and started playing! I had turned to Darren to say something around 7:36, and when I turned around, they were in mid-play already! And not only did they start on time, but there were maybe – maybe – 3 time outs in the entire game, which were all related to injuries. Hey, when a huge Pacific-Islander rams your head into the bottom part of the goal post, you might want to someone to take a look at it. Or, perhaps, get you to a doctor to get your head sewn back on. In any case, the game was non-stop action. The rules of rugby pretty much ensure the game keeps moving. There was a penalty here and there, but there were no long waits, and the clock only stopped for the injury time-outs. These men are running the whole time! No fat-asses here loaded down with pads and full armor! I found rugby hilarious and fun to watch. The players need to be versatile in that whomever scores a try (goal), also sets up and kicks for the conversion (extra 2 points). 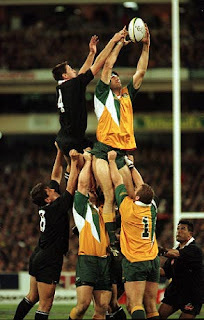 They also participate in a variety of ‘formations’ - the lineout, the scrum and the ruck. The second method seems to be the most popular. We did see method #3 in action Friday night, though: one of the Hurricanes had the ball and was being hunted down by the opposing team. Instead of trying to outrun them while holding the ball, he threw the ball down and kicked it forward as he ran towards the goal. When we got very close to the goal, he picked it back up and scored a try. It was brilliant! Very exciting! The Hurricanes (Wellington’s local team) did have cheerleaders, but they were completely useless and quite possibly the worst cheerleaders outside of Saturday Night Live. I say this because they mostly walked around waving at people or just stood around with their hands behind their backs. They didn’t actually ever cheer! No formations, no kicks, no songs. Maybe because the rugby players are thrown up in the air for the lineouts, the cheerleaders don’t need to learn any moves? At one point in the second half, I looked down at the field and saw that there was a yellow-coated security guard every few yards around the entire perimeter of the field! Apparently, a fan had tried to get on the field at some point, and security wanted to make sure no one else got any ideas. The game lasted about 2 hours all in all, with a short 10 or 15 minute half-time. When the game was over, it was just over. Everyone got up and got the hell out of the stadium! We walked with the rest of the crowd down the pedestrian parkway (which was quite possibly wider than the street we live on), back to town and home. Nice! I've seen it on TV but not up close. Great pics. I was never a fan of US football (am a basketball freak - thank goodness for ESPN international) but rugby seems much more interesting, or at least impressive than its padded American counterpart. These guys are tough! I'll have to get to a game sometime. Nice to know we can cross over easily from public transport. I'm guessing that some of those pictures aren't actually yours. You are correct, Viraj...I should have credited the pics I took from google: the top pic and the picture of the "lineout". The rest are mine. I've been to rugby, league and cricket (ODI) since I've been here, and enjoyed every one of them. Way different from America, though you can tell that gridiron (American football) is a descendant of rugby. 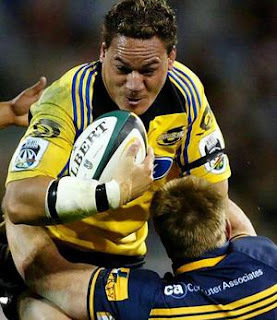 In my personal opinion,rugby players tend to be better looking than NFL players, too, which doesn't hurt. Jessica, isn't the NZ NBL basketball franchise moving to Wellington? Or do I have that confused with another team? I agree about ESPN--only in my case, it's baseball. BTW d, "American hotdog" is as close as you'll get in NZ, but it really should say "as interpreted by..." because it's not exactly the same (though they can be quite nice). I'll be curious to see what you think of them. mmmm...did I forget to mention how smokin' hot the rubgy players are? =) Certainly makes the game more enjoyable to watch!